« UO’s lawyers illegally obtained confidential student records? What’s in the records, anyway? The only clue is a 14-page memo by the UO general counsel discussing the possibility of dissolving the UO Senate after the university faculty voted to unionize. To those who suspect the administration of plotting to undermine shared governance at the UO, it’s a smoking gun. To the administration, it’s an opportunity to show that the UO stuck with shared governance despite being given a legal argument for weakening it. The other 21,986 pages could contain information about former UO President Michael Gottfredson’s departure, or the administration’s response to allegations of sexual abuse against three UO basketball players. Information of this kind should be public, or is likely to become public in the course of litigation. So no wrongdoer can be identified in the release of the records, and no damaging consequences have followed. A detective might conclude that there’s nothing for the university to be terribly upset about. I apologize to the Register Guard for posting their entire editorial. Given the subject, I hope they won’t sue me. All my posts on the Presidential Archives can be found here. But Lim’s memo was leaked to Bill Harbaugh, a UO economics professor who posted it Thursday on his blog, UOMatters.com. Harbaugh has repeatedly declined to comment on matters including whether he’s the person who has the records. He says his attorney has advised him not to talk yet. Sorry Tobin, but Eugene’s community pride isn’t just about “unique foods”. We’ve also got a legacy of free speech (obligatory Wayne Morse link) and some of us aim to keep it that way. 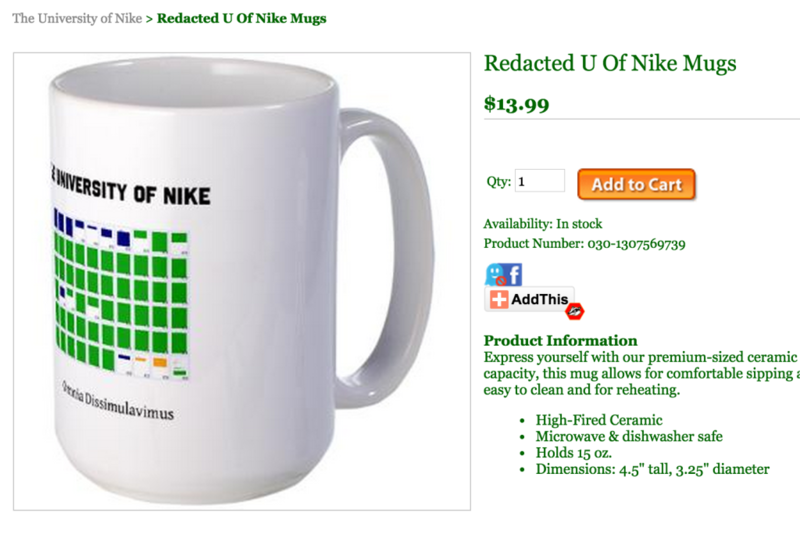 Speaking of which, redacted U of Nike coffee mugs are still available, here. All profits go to buy UO public records from Dave Hubin. Or maybe to someone’s legal defense fund? I loved their first paragraph, best I’ve seen in the editorial column. “Dogs [who] do not bark” indeed. Sounds like a certain commenter we know well. But it’s not a fig behind the fig leaf. It’s a Johnson Hall. Is this blog maintaining a tally of nationally embarrassing scandals? I count three in the past 10 months. Why on earth is the administration making a big deal about this? Why is the president sending emails to everyone on campus? Why indeed? There are generally two possible explanations for inexplicable acts: incompetence and malice. Ordinarily I’d go with the first, but this looks to me like a case of the second gone horribly wrong. Librarians make info available to patrons. If JH or the BOD wants a vault, they should pay for it. It might cost 1 or 2 high level admin positions for a few public records specialist librarians ($200k admin salary = 4 librarian positions, or figure it out by lawyer fees). But as it stands, the UO Library does not have the resources to deal with controlling any level of sensitive public records. They can barely keep up with regular requests and archiving tasks. BOD, JH, and Library Dean all owe everyone at university archives a huge apology for the way they have been stomped on and abused. Pathetic. Does it have to be either/or? Looks like both to me. I’m extremely disappointed with the way our new Library Dean threw her employees under the bus and turned her back on ALA principles and professional archival standards. Or a detective might wonder whether the UO’s lengthening string of ham-handed attempts to cover up scandals, stonewall media, sideline faculty power, and raise unnecessary alarm might point toward deeper issues. There are certainly things for the UO to be terribly upset about. For instance: This latest blunder is, in addition to everything else, a textbook case of how not to do public relations. The weird timing and wording of Coltrane’s alert, designed to set the framework for public debate – a classic PR move to be first out of the box and make this about security, safety, and illegality rather than cover-up — succeeded to a degree (note reader comments in the media recommending that the archivists and the professor who requested the documents be fired). But it was handled so badly that it’s backfiring, raising more questions and inquiry, and making the admin look foolish. My bet is there’s something damning in those documents; but even if there’s not our hapless UO administrators are doing their best to make it look like there is. It’s a tragedy either way. is it really all this hard? It would be really nice if you could ask what has happened to those poor archivists who have probably given their professional lives for you. Believe me, I want to know too.